This startup’s founders eat their own kibble—and they plan to feed you someday too. Someday the meat you eat will be as likely to have grown in a lab as on the farm. And the pathway from the lab to your plate may run through the sloppy dog dish on your kitchen floor. Ryan Bethencourt and Ron Shigeta, two of the minds behind the biotech accelerator IndieBio, are about to launch a line of slaughter-free pet food with a company they call Wild Earth. First, they’re hitting the $30 billion pet-food market with dog kibble made with protein manufactured by living cells. That product comes out this spring. Next, in a year or two, they intend to produce cat food made with real mouse meat but no actual mice. The meat will be grown by propagating mouse muscle cells in the lab. Cats may lap it up, but the idea concerns some inventors who want finicky humans to stay hungry for lab-grown meat, too. “We’re really using biology as a technology to do molecular manufacturing of food today, and that’s something that all of us nerds have been dreaming about forever,” Bethencourt says. Wild Earth’s first product, for dogs, relies on a microscopic fungus called Aspergillus oryzae, better known as koji. The small team at Wild Earth, based in the Bonneville Labs biotech incubator in an industrial area of Berkeley, California, feeds it sugar water and houses it at the ideal temperature, with the right pH and oxygen levels. And the happy koji churns out protein that the team then bakes into kibble. The fungus is, in essence, the manufacturer; the humans selectively cultivate koji strains with useful properties, such as fast growth or high output of protein or vitamin A. With peppy enthusiasm, Bethencourt pulls petri dishes out of the lab’s incubator and shows off the strains of A. oryzae growing inside. We’re in a room Wild Earth shares with Finless Foods, which is growing fish fillets in the lab and is one of IndieBio’s investments. Wild Earth’s petri dishes don’t look exactly appetizing. They’re filled with organisms growing in an array of gag-inducing forms and colors. Some look like lumpy white cheese, others like the kind of spongy brown mold that you might find under your deck after a wet winter. The lab smells faintly yeasty. 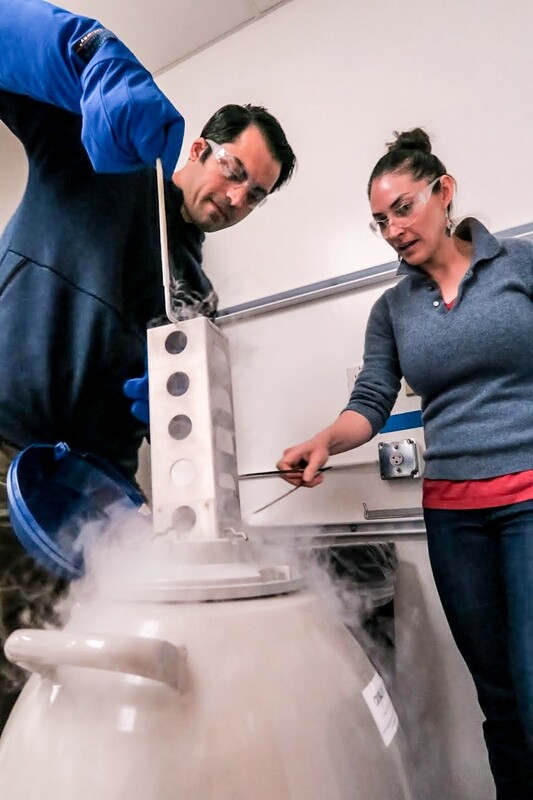 Ryan Bethencourt and Wild Earth’s head of operations, Abril Estrada, open a liquid nitrogen canister to extract tiny samples of Wild Earth’s next product in development: mouse meat for cats, grown without any actual mice. Appearances aside, koji has been used to produce human food for hundreds if not thousands of years. It’s a fermenting agent, similar to the microorganisms found in a sourdough starter, used commonly in Japan to produce soy sauce, miso, and sake. Bethencourt likens the Wild Earth protein-production protocol to something not so different from home-brewing beer. In fact, he and Shigeta hatched the koji idea because Shigeta was growing his own fungi in the lab to use in making sauces at home. “It would drive me nuts sometimes, because I’m like, ‘Hey, those fungi grow really well, be careful you don’t contaminate any of the other plates in the refrigerator,’” Bethencourt says. 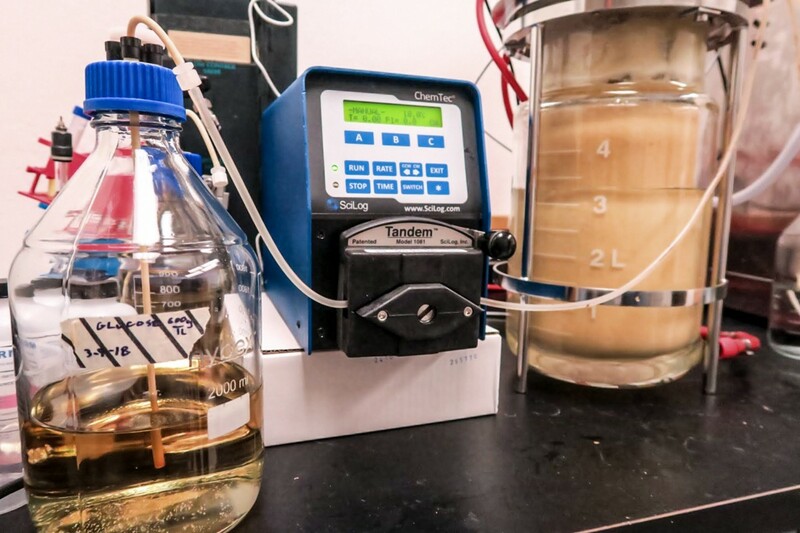 In another lab room, a five-liter glass container called a bioreactor spins a milky beige solution of A. oryzae spores mixed with sugar water. The volume of the mixture will nearly double over a few days, as the fungi munch on sugar and pump out protein. Then, fermentation technician Chris Thompson-Kucera will strain the mixture through a mesh bag designed for making almond milk, extracting a thick, tahini-like paste. Wild Earth’s mission excites Bethencourt in particular because he is a vegan for reasons of animal welfare. (Shigeta is an omnivore.) He foster-parents rescue dogs and feels unsettled feeding them meaty kibble made from other animals that might have suffered in the production process. Conventional pet food also suffers from a mystery-meat image and public suspicion about its supply chain, as it’s made from “byproduct,” animal parts not used for human food. The fact that several leading brands of dog food were recently discovered to have small amounts of sodium pentobarbital, a euthanasia drug used to put animals to sleep, didn’t help. An argument also can be made that meatless pet food will have a smaller environmental footprint. Producing meat for pet food gobbles up huge quantities of land, water, and fuel. But Bethencourt believes the animal welfare aspect, as with cage-free eggs, will sell better. He also plans to monitor the health of his earliest canine customers, and hopes to prove that dogs eating meatless diets have lower rates of cardiovascular disease and cancer. Vegan dog food already exists — along with some controversy over whether it’s really nutritionally suited to dogs. Cailin Heinze, a nutritionist at the Cummings School of Veterinary Medicine at Tufts University, explains that dogs can theoretically thrive on a meatless diet, but “there is a much more narrow margin for error for a vegan diet than a more traditional diet that utilizes both plant and animal ingredients, so these diets are much harder to formulate.” A 2015 study of 24 vegetarian foods for dogs and cats found that almost all contained the minimum recommended protein levels but only one in four had adequate amounts of amino acids. Heinze adds that there isn’t enough research to know whether dogs on meatless diets stay as healthy as others over the course of years. Given the uncertainty, she does not recommend strict vegan diets for dogs except those with certain health conditions—though she writes that “most dogs can do quite well” on a vegan diet that’s carefully designed. The bioreactor at right contains a swirling brew of future dog food. Spin koji spores with a bit of sugar water, and they produce a beige-colored protein. So what, besides the protein source, sets Wild Earth apart? The company claims that its kibble will have a higher protein content and eventually, as production scales up, a lower cost. Popular vegan and vegetarian dog-food brands contain about 18 to 24 percent protein and can cost upward of $50 for a 20-pound bag. Wild Earth’s inventors say theirs will contain 30 percent protein. At first, it will be a premium product, at over $20 for a five-pound bag. But since koji is so low-maintenance (and does not, unlike plant protein, require large-scale agriculture to produce), the founders aim ultimately to bring the price down to mid-range. Bags of Wild Earth’s prototype kibble sit on a desk amid the rows of bright cubicles in Bonneville Labs’ work space. These are “vegan bacon” flavor and baked with a blend of koji-made protein and chickpea flour. Wild Earth’s head of operations, Abril Estrada, is experimenting with different flours, such as buckwheat and pea, to get the right fiber content and texture. She’s also fine-tuning two other flavors of kibble: vegan cheese and vegan chicken. Once those recipes are ready, the food will be produced at a commercial kitchen in Oakland. Wild Earth intends to deliver its first bags for sale to 100 handpicked customers in June. Estrada offers me a piece of the brown, oval-shaped dog food. It is dense, crunchy, and earthy, with a taste like a dark rye cracker. Bethencourt pops one in his mouth, too. “I’ve eaten so much of this stuff,” he says. This mouse meat was grown in the lab from an existing line of mouse-muscle cells normally used for science experiments, not food. It’s key to Wild Earth’s aim to make cat food, because cats, unlike dogs, must eat meat. Wild Earth still has to develop a way to culture the cells without bovine growth hormone. Making lab-grown meat for dog food will be next. Wild Earth’s product rollout has a stealthier aim: a stepwise progression toward normalcy for animal-free meat. If fungus-made protein for dogs is Wild Earth’s gateway to lab-grown mouse meat for cats, then the cat food is Bethencourt’s Trojan horse to introduce lab-grown meat for humans. But getting there by way of pet food? Bethencourt acknowledges that he has colleagues in the lab-grown food industry who wish he wouldn’t go that route. Lab-grown meat already will have to overcome an ick factor among some people. If the first major commercial lab-grown meat product is pet food, won’t people think lab-grown meat is (wait for it) for the dogs? Bethencourt, though, is going to the barricades, aiming to upend an industry that he sees as unkind and unsustainable.